The transportation manager for a major consortium of East Bay school districts, has pledged to dig through dozens of maintenance and inspection records following an NBC Bay Area investigation that raised his concerns about the maintenance of Durham School buses. George Anich is the president of the South County Transportation Group (SCTG), a consortium of ten East Bay school districts that contracts with Durham School Services. They are responsible for safely transporting kids to and from school, however bus drivers are speaking out, concerned that their buses are breaking down. “Screws are falling out and they are dropping on the kids heads,” Loraine Ramirez told chief investigator Tony Kovaleski. She is speaking out after six years behind the wheel of a Durham School bus. “My bus leaks massive, and the brakes are going out right now and every time I take it in for maintenance they tell me we don’t have parts,” said Ramirez. “They know they have issues with the buses,” another veteran Durham bus driver told Kovaleski. He also sees the problems, however he asked us not to disclose his identity out of concern for his job. Both drivers say they have witnessed breakdowns on numerous occasions. According to its website, Durham School Services is a private company and provides buses for students in 350 school districts in 30 states. The company claims to provide increased service, cost efficiencies and safety. Yet the drivers we spoke with from Durham’s Hayward and Livermore yard raised concerns regarding the maintenance of Durham’s buses. Ramirez told NBC Bay Area she has been reporting brake problems on her bus to Durham for the past five months and they still have not been changed. The unidentified, longtime driver told Kovaleski he has also experienced problems. “Only six months ago we had one day where we had 6 to 7 breakdowns in one morning shift,” said the veteran driver. We reviewed the California Highway Patrol’s (CHP) inspection records from both locations for the past three years. Although the CHP gave Durham a satisfactory score, the records show problems, the records appear to support the drivers concerns. Inspections dating back to 2009 produced 102 violations on 81 different buses at Durham’s Hayward and Livermore facilities. Violations include a malfunctioning break line, an emergency door with exposed wires, three buses with exhaust leaks, three with cracked coil springs, four buses with missing or loose bolts and one bus with an empty fire extinguisher. Kovaleski showed the records and interviews to Robert Berkstresser, an independent expert with three decades of experience driving and managing commercial and school buses. Berkstresser also serves as an expert in civil court cases involving buses. In one case he testified in support of Durham buses. “These types of things shouldn’t happen,” said Robert Berkstresser. Berkstresser says the CHP inspection records tell a story of neglect. When the drivers spoke of breakdowns, Berkstresser saw that as a red flag. 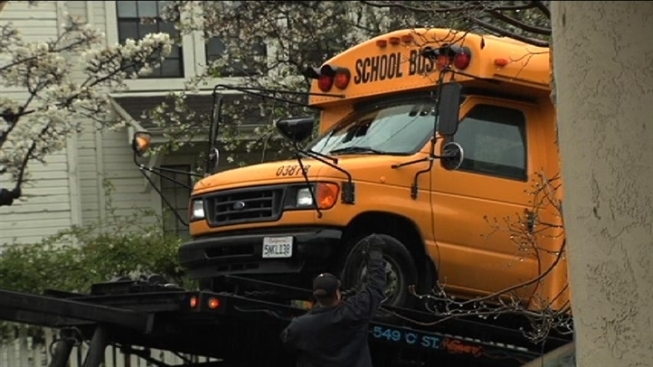 Back in March, our cameras were able to capture another one of these broken down Durham bus, this time in Alameda. Emails from the Fremont Unified School District, uncovered by NBC Bay Area, detail more issues with the buses. One email from February 2012 written by a Durham employee alerted the district to three bus break downs in one morning. One of these breakdowns resulted in 17 students arriving to class more than an hour late. We definitely had some on time performance issues.” Jim Gannon told Kovaleski. Gannon serves as the Transportation Manager for Fremont Unified School District. “The things that I am seeing are typical of an aging fleet. And is the fleet getting newer? No. It’s getting older and is that something the consortium is going to be dealing with, I am sure it is,” Gannon said. SCTG board president George Anich is responsible for managing Durham’s contract for the ten- school district consortium. Member districts include Castro Valley, Dublin, Fremont, Hayward, Livermore Valley, , Newark, Pleasanton, San Leandro, San Lorenzo and Sunol Glen unified school districts. Anich told us he had no recollection of the six breakdowns in one morning shift, and said he has never asked Durham to see its CHP inspection records. “I am concerned about that, about what you are saying about the violations. I would like to know more about the violations, I will look into that.” said Anich. NBC Bay Area placed several calls and sent several emails to Durham’s local and national offices. The safety of the students we transport is the top priority for Durham School Services. In the Bay Area, we have more than 400 professionally-trained bus drivers who are committed to getting students safely to and from school, every day. Our school bus drivers are some of the most well trained drivers on the road. We are proud of our team of drivers and are committed to providing them the tools and training necessary to succeed. While our employees are our greatest assets, our fleet is critical in delivering our service to our customers as well. We have a comprehensive maintenance program, which includes each driver completing a pre-trip inspection of the bus prior to the vehicle being used for service. All Durham School Services’ California operations have passed the most recent California Highway Patrol inspections. Our focus on safety, customers, people and the communities we serve ensures we meet and exceed our customers’ expectations in providing safe, reliable transportation for their students. In communications to the South County Transportation Group, Durham has pledged to add additional mechanics, improve its maintenance issues and purchase additional parts. One transportation manager told us, in recent months he has seen a marked improvement. Do you have a tip you think we should investigate? Call us at 1-888-996-TIPS (8477) or email theunit@nbcbayarea.com.